AVERAGE OPPOSITION.COM: The Bale Effect - One Man Team? The Bale Effect - One Man Team? There's been plenty written about Gareth Bale of late, and rightly so - he's currently the form player in the Premier League and his goals have been worth 17 points for Spurs this season. But what about the rest of the teams? And what happens when you take each of the main points winners out of each team? It's been mentioned a lot that if you took Gareth Bale's goals away from Spurs, they'd be 17 points worse off and down to 37 points. That would leave them in 10th Position, and closer to the relegation zone than the Champions League places. Sound logic? No, not really - the only fare comparison would be if you levelled the playing field and took every team's top points scorer out to see what happens. Remove Bale's goals and it becomes West Ham 2-1 Spurs. This means they're down 3 points. Simple enough. If you were to remove one goal from a 1-0 win, then they lose 2 points as they would have still won a point for a draw. It's not an exact science as you don't play with 10 men and someone would replace them, but it's a good guide. Well that settles it! Whilst Bale is the difference between Spurs being in the magical top 4 positions or not, then he has been the difference. If for example you took him and Santi Cazorla out of their respected clubs then it's Spurs that would feel the pinch more than their North London rivals, who would actually go up a position. What does this mean? Well the teams that have risen up the table can point to less reliance on one particular player. Those in red that have fallen, are too reliant on just one star player. 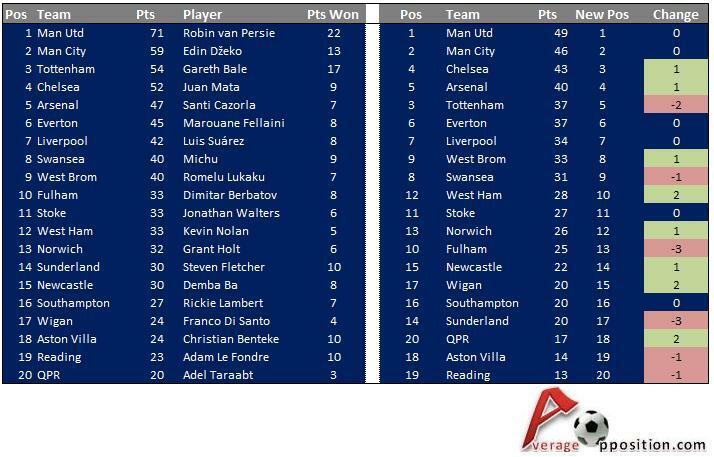 Man Utd's Robin van Persie may be the highest points scorer, but United would still be top if his goals were removed. 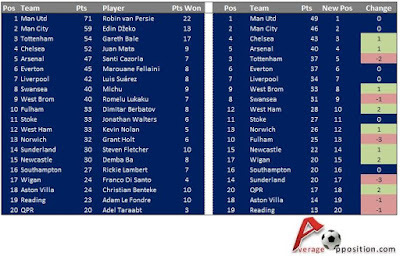 In fact, the two teams most reliant on their top points scorer in this measure are Sunderland (Fletcher) and Fulham (Berbatov). Both would fall three positions. Well going back to that West Ham vs Spurs game, and at 2-1 to West Ham, Joe Cole played Matt Taylor clean through for a one on one opportunity against Hugo Lloris. The keeper was off his line in a split second and pulled off a great save. At 3-1 with 20 minutes left, it's unlikely Spurs would have won, regardless of Bale's second goal. This measure doesn't track the impact of these incidents, so is admittedly slightly flawed, but that hasn't stopped people from doing it anyway!